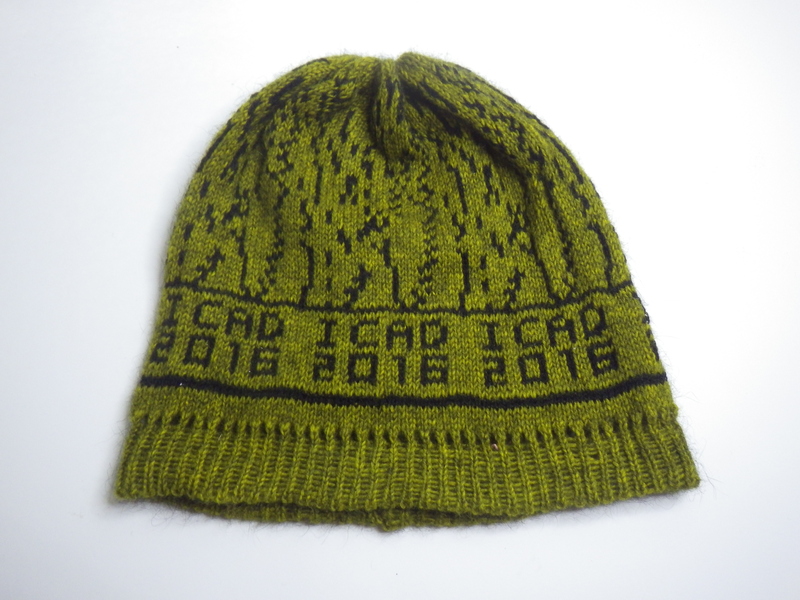 The ICAD 2016 Data Beanie is dedicated to Dr. Greg Kramer, the organiser of the first ICAD conference in 1992. We are privileged to host the 22nd ICAD conference in Canberra in 2016. The ‘data beanie’ is knitted from possum fur and designed to keep your head warm in the frosty mid winter mornings in Canberra. This beanie is computer knitted from punch-cards that encode data logged from seals diving under the antarctic. Nigel Helyer sonified this dataset with music boxes in his concert piece Biologging Retrofit. I transferred Nigel’s musical punchcards into a pattern for the beanie, and worked with Angelina Russo to produce a series of prototypes for a computer knitted beanie, in 3 different colour schemes, for attendees at the ICAD conference. Attendees to the conference heard the dataset that was knitted into their beanie played on music boxes in the ICAD concert. We developed the idea further into a “data scarf” and Angelina led a workshop at the conference, where 10 women designed scarves based on their own datasets, which included daily temperatures in Canberra, a calendar of family birthdays, a Ph.D. thesis on the effect of music on typing speed, and the budget of an arts studio. Ian Warden devoted his entire Gang-gang column in the Canberra Times to the data-beanie :).